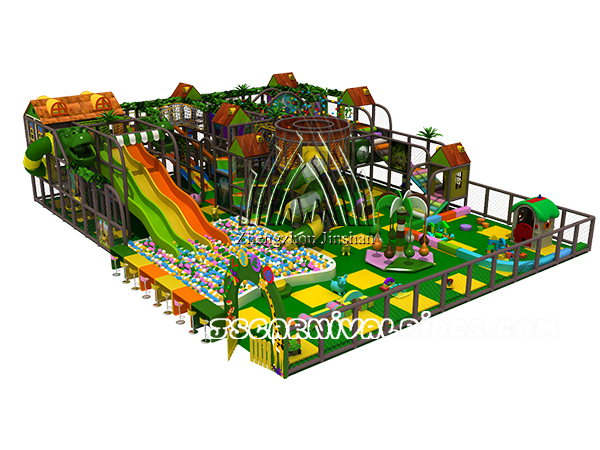 There should be some specialties on promotion for kids indoor playground, and it is mainly embodied in the following two aspects: consumption for children market is determined by their parents. That is to say, kids play area not only need attract children love, but also need parents’ acceptance, and at least it can not make parents feel averse. However, operators usually ignore the opportunity to communicate with customers, and focus too much on price. Maybe low price can cater parents rational requirements, but it can not motivate their sentimental demand. We always believe that operator must build the feeling of friendliness, love and trust with consumers for a successful popular indoor play area. It is a main part and also it is essential safety equipment for kids indoor playground to ensure their safety when playing there. Therefore, designer will install some protective net in some imperative positions. However, it looks not so beautiful, so some operators will ask designer to delete them. If fact, it is very bad for children’s safety. So you can ask your designer to make your whole indoor playground more attractive, but please keep in mind that safety is the first. 2.Maybe it can not attract more children even whenthe operator like your play area. The adults usually prefer elegant color, because it looks more marvelous and high-grade.On the contrary, kids prefer colorful bright items. Maybe you do not like Happy Lamb and Big Grey Wolf, however, it is children’s favourite elements. So operators need to consider more requirements for children when designing. 3.It can not be so impact for amusement equipment. For some small play area, customers always expect to install more components in the limited space and then it will be oppressive and breathtaking. Moreover, most kids have no self-protection awareness, and parents need to look after their kids nearby. So it will be difficult to pass through when space is too small. Next： How to Arrange The Location of Amusement Equipment?